Firstly, I'd like to say that Snopek family doesn't have blue blood. We came from family of paupers, owners of little cottages, labourers or shepherds - from poor family. But there is an exception about the blue blood - descendants of Teodor Snopek (1931 - 1993) who married to yeoman's Redeky family from Drzkovce when he married Barbora Redeky and descendants of Maria Snopekova (born in 1964) who married Stanislav Vareny (descendant of yeoman's Vareny family from Horne Drzkovce and Cuklasovce). We don't know who was the first one who resided in area under the Inovec yet. The oldest surname Snopek had Adam Snopek who was born in 1741 (he was married with Katarina Tulakova from Dubodiel) and approximately in that time there were Jan Snopek too. They were probably siblings and the children of the first Snopek who resided in this area because according to census from 1715 there wasn't any Snopek. I'm not sure about his descendants, so I can't deduce the direct line for sure (for more information look the section FAMILY TREE in articles "Are we from Adam?"). Jan Snopek is confirmed like our the oldest ancestor. He was born in 1775 and on the finish of 18-th century he was married with Rozina Kapalova (Sevcikova) in Jacovce. In the same day Andreas Snopek (born in 1777) was married with Katarina Dubay in the same church, so they were probably brothers. Andreas had three children with Katarina and between 1808 and 1810 they moved to Hrezdovce where Katarina died. He got married again with Eva Sebakova from Male Chlievany. They moved to this village and Andreas had ten children with Eva. Other siblings of Jan were probably Jozef Snopek (wife Eva Misikova) living on Cimenna too in the next-door house and Johanna Snopekova, later she was the wife of Jozef Mihalech in Cuklasovce. Concerning Jozef we know just about births of his five children and the last information about him is in a register of taxpayers on Cimenna in 1828 where is mentioned one daughter in a labour age (inhabitants from 18-60 years) - parish registers of Mala Hradna (or Dubodiel) don't mention this daughter. Jozef was a farmer farming on nine Bratislava's measures of ground (1,62 - 1,935 ha) but also on meadows for 1,5 mowers (approximately 0,5 ha). He didn't breed any cattle. Our direct ancestor Jan lived with Rozina Sevcikova in Cimenna (like the most of Snopeks in the start of 19. century) and they had twelve children - five sons and seven daughters. Just two sons and three daughter lasted out the adulthood. In the year of birth of our Jan there is a repugnancy between obituary of parish of Dubodiel where the birth is 1771 and between marriage register where the birth is 1775. Jan Snopek was an average farmer according to a register from 1828. He farmed on 10 Bratislava's measures (1,8 - 2,15 ha) and on meadows for three mowers (2,52 - 3,87 ha). To his farmstead belonged also two oxen and one cow what didn't have anyone in Cimenna on that time - only in a family of reeve was one cow and one was in a family of Jew Grunisch. From that register of taxpayers which was made on August 10, 1828, we know that Jan Snopek was a juror to the reeve Juraj Lagin. From Jan's sons our direct ancestor is Michal (born in 1811) who got married in 1833 with Juliana Zatkova from Svinna and they lived in Cimenna. Michal Snopek was small-holder. They had seven daughters and two sons but two daughters died as children. In the end of thier live they lived with the family of their son Jan in Cuklasovce. Both Jan and Adam had their own families. Adam Snopek (born in 1844) worked for most of his lifetime as shepherd. At first he was a flyman and servant in Dvorec. In 1872 he got married with Maria Mokranova (Grznarikova) from Velke Chlievany. She is written with the surname Mokranova only when she was getting married. In a parish register she is written as Grznarova in data about her children. She had a married when she was already pregnant with their first child Michal. Michal died after trimester. Soon after this their son Jozef was born and after three years was born their daughter Anna. After Anna's birth Adam Snopek and his family moved to Dolne Drzkovce. Their daughter Anna died when she was half of year of angina and after two moths Adam's wife Anna died too of tuberculosis. After the dead of Maria Adam got married with Magdalena Adamcova from Ruskovce. They had six children there. We just know that Jozef, son from the first marriage died when he was seven one year after the second wedding of his father. The first son of Adam and Magdalena was Jan. Second son died when he was four months old of smallpox, another son Peter died when he was three of cancer. In the same year next daughter Magdalena was born and after trhee years there was another son Michal who died after four years of dropsy. The last child was Jozef who was born in 1894. From the baptismal names which were given to children we can see that Adam held in reverence his father Michal. 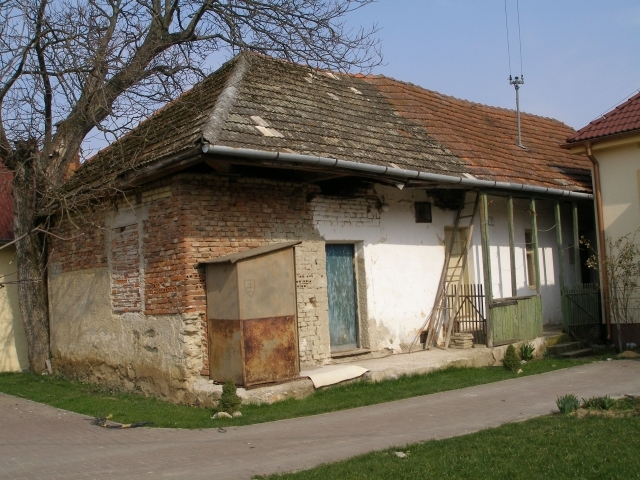 We know from archiv of real estate register, that Adam and Magdalena Adamcova lived on the finish of 19-th century in a house afetr her parents (Ruskovce 4). In 1900 his wife Magdalena died of pneumonia. Adam had to take a care of two underage children - 13-years old Magdalena and 6-years old Jozef His Son Jan had 20 years in that time. In November 1901 Adam got married for the third time with widow Eva Skerdova. This was his shortest marriage - Eva died after three months of tuberculosis. In 1904 there was an inheritance procedure after deceased Adam's wife Magdalena. The house where they lived inherited children Jan, Magdalena and Jozef Snopek. Adam died of typhus in 1914. The oldest Adam's son Jan got married with Helena Nikova. They had six children. Children Jozefina, Jozef and Stefania died in babyhood. The first daughter Johanna got married in 1924 with Jozef Kurtis. According to parish register there were a daughter of Jan Emilia and son Jan (born in 1920). We don't know anything about them. In 1927 Adam's son Jan Snopek (born in 1880) bought yeoman field in "Hajne" with a carve of 43,16 ares at the price of 1000 coronas. In 1933 he sold it to Jozef Brindza and his wife Julia (Adamcova). In the chronicle of Ruskovce there is that it was Jan Snopek from Sedlicna (now it is Trencianske Stankovce). Jan sold it probably because nobody from the family lived in the village and it wasn't economic looking after this property. Adam's daughter Magdalena got married in 1908 with Ondrej Sladek-Lukac from Borcany (she probably moved there too), son Jozef (born in 1894) get married in 1922 with Jozefina Cackova in Dezerice and in 1923 they had their first son Anton. Then they went to Czech for a job. They stayed in Prag and they worked on a property like labourer farms. They had three another children there. Anton, Emil and Bozena had their families in Czech, the youngest one Jozef went to Bobot to help his grandma who took a care about his befallen sister Amalka when he was thirteen. He get married, has a family and lives in Trencin. My direct ancestor after Michal Snopek is Jan Snopek (born in 1840) who got married with Anna Mikulova, called Zabavska. They had five children: Stefan (born in 1869), Augustin (born in 1871, he died when he was nineteen of tuberculosis), Anna (born in 1874), Jozef (1878-1921) an Jan Nepomucky (born in 1885). They lived in Cuklasovce, the number of house was 18 but daughter Anna was born in Dubodiel and sons Jozef and Jan were born in Cuklasovce in house with number 5. Jan (born in 1840) was a farmer at first, then shepherd and when his daughter Anna was born he was an assistant of tenant (landlord of noble estate). During the born of his last sons he was a pauper. After the death of his wife Anna Mikulova Jan Snopek (born in 1840) got married again in 1896 (he was 55) with Anna Simkova who was 21 years younger than Jan. Jan died when he was 79 (in 1909), his wife died after two moths (she was 46). Anna Snopekova got married to Nove Mesto nad Vahom with Vincent Sadila from Horna Ves na Morave (in 1899). Then we know just that she died in February 1918 in Nove Mesto nad Vahom. About Augustin we know just dates of birth and death. He died when he was nineteen of tuberculosis. Jozef (born in 1878) got married in 1900 with Anna Kovacechova from Ruskovce. Jozef worked here for a farmer as a servant. In Ruskovce their daughter Maria and son Jan were born. This married couple left probably for job to Nove Mesto nad Vahom in 1902-1903 where Jozef's sister Anna was living. They had five children: Anna (she died when she was 2), Emilia, Anna (died when she had 6 months), Jozef and Jozefina (she died when she had 6 months too). In May 1910 died Jozef's wife Anna Kovacechova in Nove Mesto nad Vahom and Jozef got married for the second time after two months after Anna's death with Anna Vrzalova. With this Anna he had three children: Paula (got married in 1929 with Rudolf Olas) and Ilona. In the time of Jozef's wedding he worked like flyman and they lived in a house which belonged to the Martinus family (number 219 - later his nephew Jan, emigrant to Argentina). In a parish register of Mala Hradna there is a note about Jozef's birth and death in 1921 next to the date of his birth. This record is according to law-court in Trencin from 1943 by which was Jozef declared like dead. Between the archive's data of Trencin's regional court there is no file, so we don't know for now what happend with Jozef. Jozef's son Jozef (born in 1907) had with wife Maria Patrikova (the wedding in 1936) sons Bohus, Jozef (he died when he had 2 months), another Jozef, Milan and Rudolf. 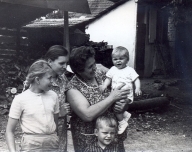 This family lived in Mnesice, the local part of Nove Mesto nad Vahom. About Jan Nepomucky (born in 1885) there is a note in parish register too. It says that he got married in 1909 with Julianna Skotnyarova from the village Nagyloc in Hungaria. The oldest Jan's son Stefan is my great-grandfather. Stefan was a labourer on a manor of some farmer from Drzkovce, so he worked with horeses what became fateful for him - runaway horse kicked him to his leg so badly that they had to amputate Stefan's right leg under the knee. He couldn't work for the farmer anymore, so the farmer took him to educate him as tailor and he bought him a sewing-machine. This trade couldn't sustain him in poor times and poor locality, so he got a post of beadle and night-watch. In times when Stefan worked for the farmer he met there a maid Vincencia Tarabova from Jablonany in Morava and they got married. In the year of the wedding (1895) his first son Jan was born and after four years my grandfather Stefan was born. After another four years they had the only daughter Maria. But she had a bad luck. In August 1904 there was a fire of the house where the family lived. Even they took Maria to the next building to protect her from the fire, the fire caught her up here and Maria died of many injuries. The next child of my great-grandparents was Frantisek (born in 1911). 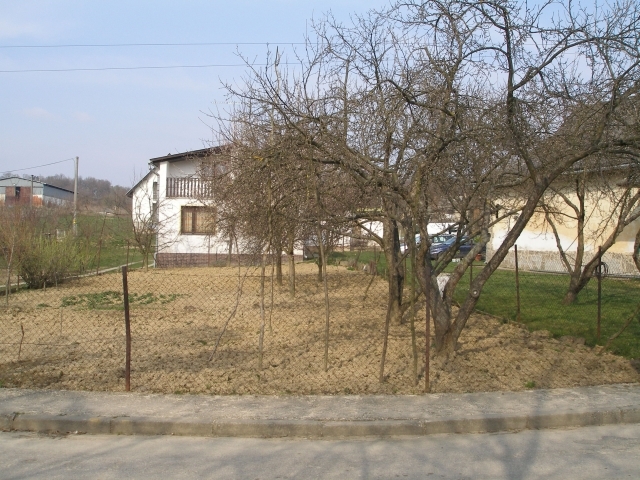 Residential locality of our ancestors - there are all men ancestors, from women there are just these who were born to Snopeks (processed Pavel Oller following statistic date supplied by myslef). If you click on the picture you'll see it in its original size. Our ancestors weren't rich and everything what they had were their naked lifes, love between them and if they owned something it had been slogged. Trade wasn't their priviledge in the past. In was just occasionally and most in later years when Stefan Snopek (1869-1942) was skilled to a tailor because of disablement involved by injury on the farm where he had worked. He skilled his sons as tailors too - Jan, Stefan and Frantisek. In the small villigae they couldn't expect some big earning, so the family was still starveing and Stefan Snopek became a beadle and night-watch, clattering on the road by his wooden prosthesis. 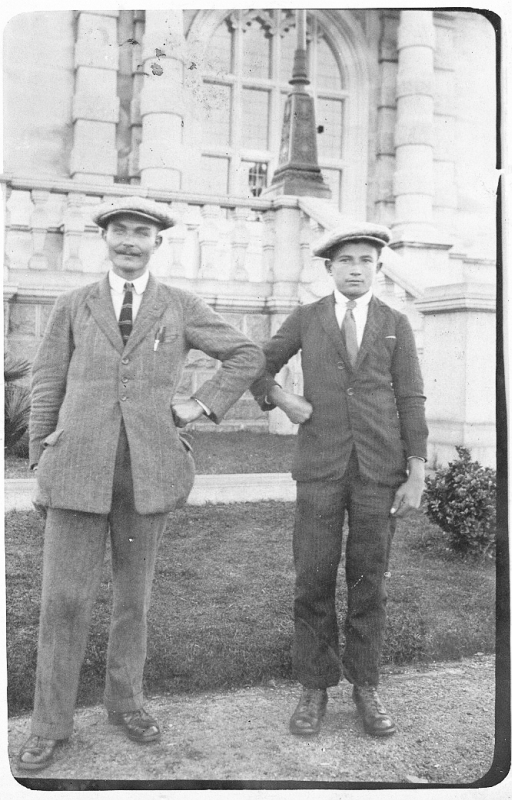 It is not suprise when in emigrating wave for livelihood across the ocean was his son Stefan (1899-1955) and later son Jan too. Only the jungest son Frantisek stayed at home. Both Stefan and Jan were working in Argentina, Stefan worked as gardener. Stefan came back to his family after eight years (he had already two sons - Stefan and Kliment). Jan settled down in Argentina with his family (daughters Elena and Margita and son Milan) where he worked as tailor and he sold cloths. All his children were born in Nove Mesto nad Vahom (number 219 where had lived his uncle Jozef before too, who was born in 1878). Milan had two daughters (Teresita and Nancy), so this line doesn't have another Snopek continuation. Governor of province of Jujuy in Argentina, Carlos and Guillermo Snopek weren't our relatives - they've czech lineage. Before Stefan Snopek left to Argentina he had got married with Augustina Priecinska in 1920, the daughter of gamekeeper on Tarabovec. After the arrival from Argentina Stefan Snopek wasn't rich but he was succesfully bought very large garden at the edge of the village in an auction which is still in the owneship of Snopek family. On this land Snopeks built their own house. 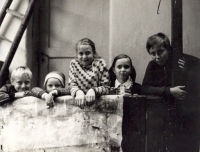 Until this they had lived in a old house with their parents which was neighbouring with the kindergarden from the left side. After some time Frantisek Snopek moved out to Trencin where he started a family and lived here until he died. 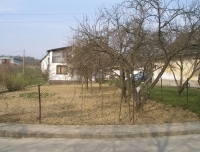 The garden was the main source of livelihood of this family, especially after plantted of several fruit-trees which fruit Gustinka Snopkova used to sell on the market to Banovce. Later the garden was splitted between all Stefan's children. Some of these children built their houses here in 20th century and they are living here until today and besides to their job they're working on their lands. Thanks this there is a street which can be called 'Snopeks' street';-). 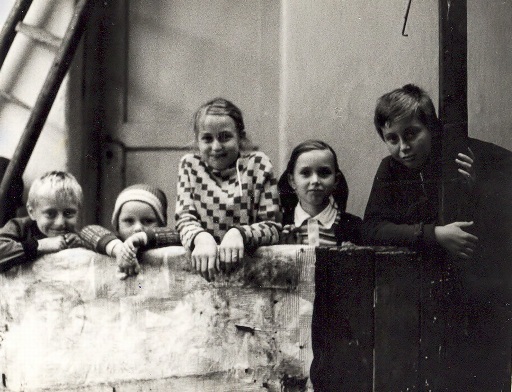 In the yard of Gustinka Snopkova's house in the past and today. 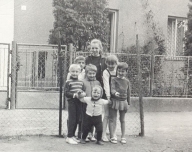 On the photo from 1965: Gustinka Snopkova, Anna (born as Masarykova) and on her knees is a baby in that year - the author of this website;-). As far as the plantation of Snopeks in Cuklasovce is conserned, following information known till now we can say that the first descendant of Snopek settled down in Cuklasovce was for some time Andreas Snopek (1777) with his wife Katarina. In 1808 they had a daughter Maria here. Soon after this Andreas and his family moved to Hrezdovce. After two years Joanna lived here (probably the sister of our lineal ancestor Jan) who got married wih Jozef Mihalech from Cuklasovce in 1810. This married couple had five children (that last one was born in 1824). The next descendant of Snopek family which settled down in Cuklasovce was Katarina Snopekova, the daughter of our until now the oldest ancestor Jan who got married with Michal Hudec from Cuklasovce in 1831. She didn't live here for a long time because she lost husband and in 1838 she got married again with Adam Durina from Dubodiel where they lived. After few years he died too and Katarina got married for the third time with Jan Durech from Dubodiel in 1824. In 1859 Anna Snopekova, the granddaughter of Jan Snopek (born in 1775) got married with Jozef Vesely from Cuklasovce. This family lived in the house number 18 for some time. However, following the register this house owned Cuklas yeomen (Kvasovsky, Morvai and others) too. It is obvious that all occupiers of the house without highly descendent were servants of Cuklas yeomen. Later, approxiamtely in 1868 Anna's brother Jan (born in 1840) started to live here with his wife Anna Mikulova and in this house our great-grandfather Stefan Snopek was born. 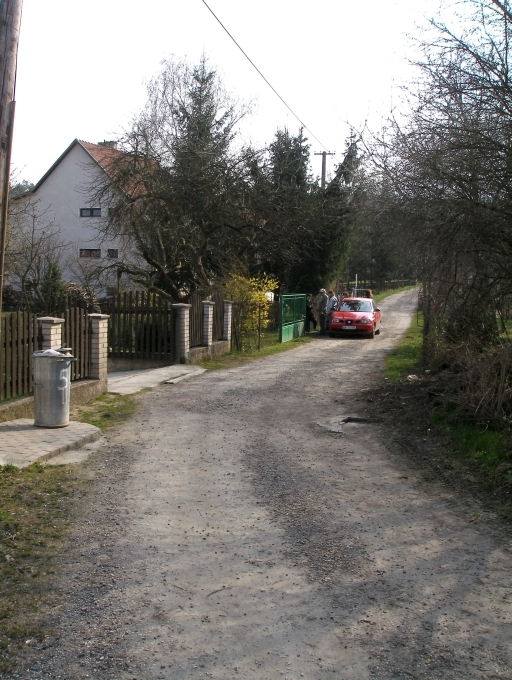 After some time Anna moved to Velka Hradna and Jan's parents came to live to Jan's house in the autumn of their lives. Jan's last child Anna was born in Dubodiel. In 1872 increased to a Anna and Jan their younger sister Magdalena, who got married with Gabriel Vesely from Cuklasovce and then they lived here too. After Jan Snopek (born in 1840) only his son Stefan (born in 1869) stayed in Cuklasovce - my great-grandfather and then his descendants. Other known branches of Snopek family aren't explored yet - we must add Andreas Snopek's family from Male Chlievany, add data about continuation of line around Trencin (Trencianske Stankovce) and Nove Mesto nad Vahom and around Topolcany and neighbourhood. "It's not truth that we haven't got enough time but it's truth that we waste a lot of it." A record from parishrecords of departeds from the parish Dubodiel about death Adam Snopek (*1741 - † 24.11.1784). A record from parishrecords of marrieds from parish Dubodiel about wedding of Jan Snopek and Rozina Sevcikova (alias Kapal) and wedding of Andreas Snopek and Katarina Dubayova in parish Velke Jacovce. A record from parishrecords of departeds from parish Dubodiel about death Jan Snopek (*1775 - † 2.3.1841). 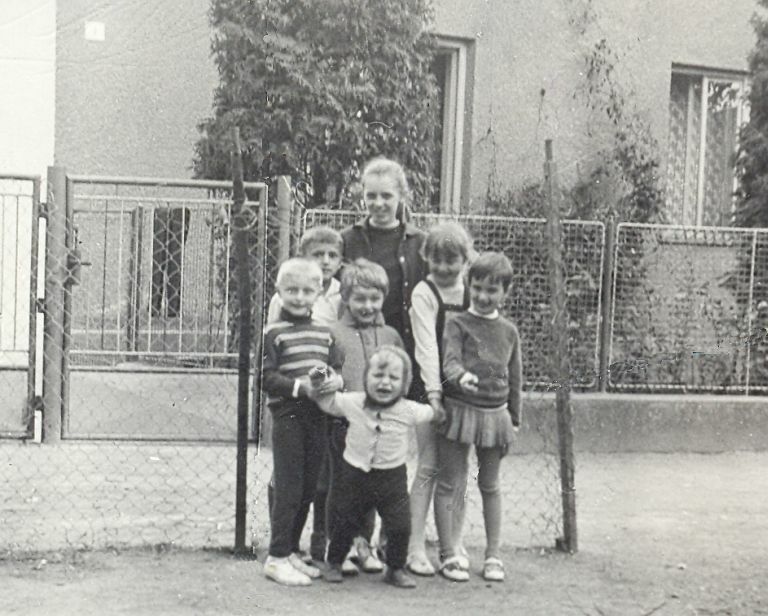 Clump (cca 1972): entirely in front the smallest is Ľuboš Snopek, behind him the three ones from the left - Milan Snopek, Rudolf Snopek and Gabika Kucháriková, in the back line from the left - Jaroslav Snopek, Olinka Kucháriková and Marika Snopková. 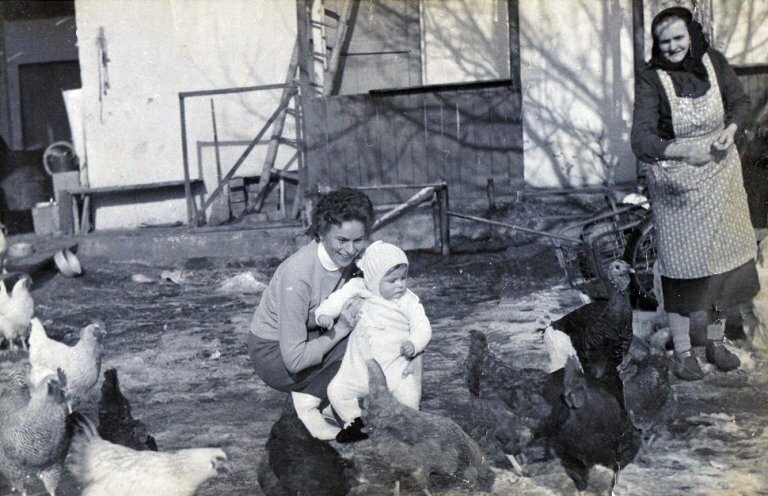 On the courtyard of grandma Snopkova (approximately in 1974) - Margita Snopkova (born Mihalova) with her granddaughter Martinka in arms. Marika Snopkova (now Varenyiova) and Olinka Kucharikova are watching them. Under them there is Lubos Snopek. 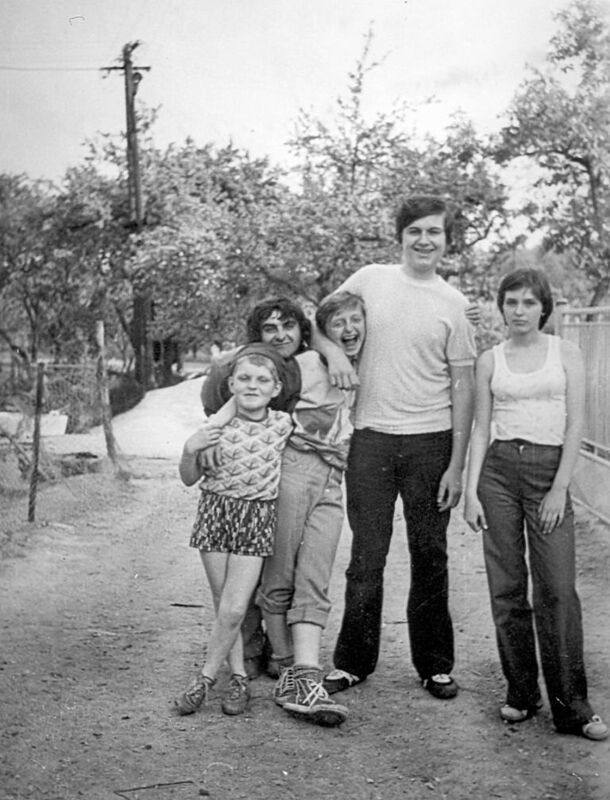 On the vacation of grandma Gustinka (around 1975) - from the left: Milan Snopek, Marika Snopkova (now Varenyiova), Gabika Kucharikova (now Hlouskova) and Juraj Snopek. Around 1980: from the left - Lubos Snopek, Vladimir Snopek jr., Milan Snopek, Juraj Snopek and Gabika Kucharikova (now Hlouskova).